TOWN OF MILTON - A dog is missing after a rollover accident sent him running off, scared. Rock County Sheriff's Office posted news of the missing dog on their Facebook page . 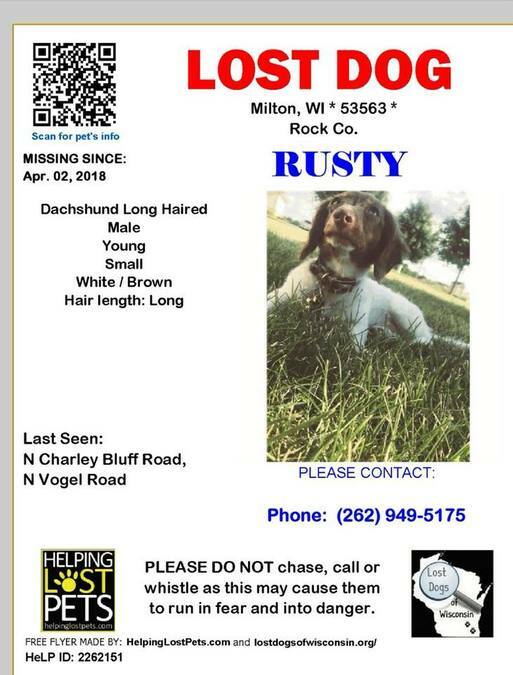 Rusty, a brown and white, long-haired Dachsund with a blue collar ran off around 11 a.m. on April 2. Rusty was involved in an accident near CTH N and Serns Road in Milton Township. The accident scared Rusty and he ran toward the Marsh, between Charley Bluff and Vogel Roads. If you see Rusty, call Rock County Communications Center at 608-757-2244 and do not chase him.